Posted on Mon, Feb 27, 2012 : 9:35 a.m.
Chelsea's Megan Hall, right, and Huron's Devin Talley during the teams' regular-season finale on Friday. Both will play in district quarterfinal games on Monday. The MHSAA girls basketball state playoffs begin on Monday with district tournaments across the state. Whether a team was undefeated or winless, it's all the same in the single-elimination tournament. Washtenaw County will have a minimum of one district champion by week's ends, with a Class D district at Washtenaw Christian made up entirely of local teams, but can have as many as five. Will Huron extend its 12-game winning streak? Will Chelsea's dream season come to an end in the first round with a tough first-round matchup? Just how far can Manchester go? Find out in previews of the districts below, and join the conversation by voting for who you think will win in our interactive polls. Monday: Huron (15-5) vs. Pioneer (10-10), 5:30 p.m.; Skyline (3-17) vs. Brighton (14-5), 7:30 p.m.
Wednesday: Dexter (17-3) vs. Huron/Pioneer winner, 5:30 p.m.; Pinckney (4-15) vs. Skyline/Brighton winner, 7:30 p.m.
Breakdown: There should be no mystery as to what happens with the Southeastern Conference teams involved as Huron was clearly the class of both divisions. The River Rats were undefeated against conference opponents with an average margin of victory of 23.7 points and should emerge from its all-SEC side of the bracket relatively easily. Brighton has proven a step above Pinckney in Kensington Lakes Activities Association play and showed its defense is no joke against No. 7 ranked Waterford Kettering in a recent loss. A likely Brighton-Huron district final will put that defense against the high-powered offense of the River Rats, who by the way play a little bit of pressure "D" themselves. Monday: Monroe (11-9) vs. Ypsilanti (8-11), 6 p.m.; Milan (5-15) vs. Saline (8-12) 8 p.m.
Wednesday: Temperance Bedford (14-6) vs. Ypsilanti/Monroe winner, 6 p.m.; Lincoln (7-13) vs. Saline/Milan winner, 8 p.m.
Breakdown: It's an all-SEC party at Saline High School, except for a young Milan team, from the Huron League, making its Class A debut. It will likely be a short one for a Big Reds team that — although won two of its final three games — still is a year or two away from a chance at a postseason run. A possible matchup between Ypsilanti and Bedford could be an intriguing one as the Phoenix are peaking at the right time, going 5-3 down the stretch, including back-to-back wins over opponents it had lost to earlier in the season, Pioneer and Adrian. If the Lincoln team that won its first five games of the season shows up for the playoffs rather than the Railsplitters who ended on an 11-game losing streak, it could make things interesting. Don't count out home-court advantage for the host Hornets, who split against Bedford in the regular season, with the home team winning each game. Monday (Not at host site): Chelsea (18-2) at Onsted (16-4), 7 p.m.; Ida (14-6) at Dundee (13-6), 7 p.m.; Father Gabriel Richard (11-7) at Tecumseh (3-17), 7 p.m.
Wednesday: Dundee/Ida winner vs. Father Gabriel Richard/Tecumseh winner, 5:30 p.m.; Adrian vs. Onsted/Chelsea winner, 7 p.m.
Breakdown: This is a district where seeding the teams would make sense. SEC White Champion Chelsea and Lenawee County Athletic Association champion Onsted are not only in the same half of the bracket, they play each other in the first game. Onsted and Chelsea are the two best teams in this district — even though the Wildcats slipped down the stretch after starting the season 13-1 — and it's a shame they'll meet in the first round. Nonetheless, that's the way of the world. The positive thing about this district is that three conferences (SEC, LCAA, Catholic League) are represented so its not just rematch city like some of the other brackets. 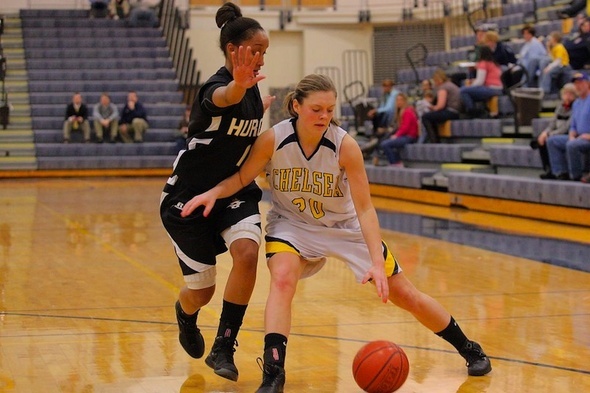 Though Chelsea lost just its second game of the regular season on Friday, 76-50 to Huron, coach Todd Blomquist said his ninth-ranked team was better for having played the high quality opponent regardless. Chelsea has five seniors on its balanced and deep roster, all of whom are itching to better their lot after losing in last year's regional semifinal. Getting to that point will be no walk in the park. Monday: Whitmore Lake (4-16) vs. Greenhills (15-4), 6 p.m.; Clinton (10-9) vs. Manchester (18-2), 8 p.m.
Wednesday: Napoleon (14-6) vs. Whitmore Lake/Greenhills winner, 6 p.m.; Willow Run (8-10) vs. Clinton/Manchester winner, 8 p.m.
Breakdown: This is Manchester's district, everyone else is just playing in it. When the Flying Dutch won a district title two years ago with a sub-.500 record, it was surprising, but if they do anything but win this year's title it will be a shock. Teams have been trying to stop Manchester by focusing on stopping McKenna Erkfritz, who has seven double-doubles and a 15.9 scoring average on the season, but Manchester is more than a one-player show. The sisters Manders — Taylor, a senior, and Jessie, a freshman — along with Jesse Coltre and Maddie Collins have all scored in the teens in separate games and can provide scoring even if Erkfritz is a non-factor. Manchester took late fourth-quarter naps against Michigan Center and Grass Lake and it cost them a perfect season and an outright Cascades Conference title. While painful, the losses may have been the best thing for them as they now seem focused for a deep postseason run. Manchester has just a 59 percent conversion rate from the free-throw line and the occasional tendency to go cold (4-of-13 against Vandercook Lake) from the stripe. Wednesday: Central Academy vs. Calvary Christian, 5 p.m.; Rudolf Steiner vs. Washtenaw Christian, 7 p.m.
Breakdown: Led by Rachel Ballantyne, Kara Goss and Becca Grimes, Washtenaw Christian has the most spread out and consistent scoring attack in this district tournament. Washtenaw Christian has played all three other teams during the regular season, beating Central and Steiner handily. Calvary Christian likely will have the opportunity to avenge an early-season seven-point loss in the final. Mon, Feb 27, 2012 : 8:35 p.m. Same reason why a number of student athletes parents sign them up for free or reduced lunch making them exempt from the pay to participate fees. No one checks. Mon, Feb 27, 2012 : 5:58 p.m. I'm still wondering why Huron gets to play 4 out-of-district players on their team. Ask them where their parents live and who their guardian is. Tue, Feb 28, 2012 : 7:33 p.m. Sorry man, how many points did your daughters team lose to them by! How hateful, grow up, let it go man, leave the little girls alone.